The South Fork climbs to Cold Gap and then I take Trail 149 (also the BMT) to a new connector which takes me to Fodderstack Ridge and Snow Camp. This is 149. ON THE UPPER SOUTH FORK AT IRON CAMP: It has warmed up some in the night and when I say night I mean it is 1:30 am, right smack dab in the middle of it. So far there's no rain and let's hope it stays this way for a gear up and a go forth at first or second light. Landon is curled up at the base of the tree directly below my food bags and Shunka is squirreled away beneath a tiny hemlock on the exposed gorund without snow. This entire place is a deep freeze coated in white powder and it is slow to melt so how will it be higher up? White. I'm thinking of the entire Whiteblaze discussion on hammocks started by Neo, a crazed purist and fanatic of the Hammock Way, I even added my 2 cents on the subject. It's all a question of this: Are we living out or passing through? Bag nights are bag nights however and in whatever way we camp but my theory is this, that the lighter our load the more we move and so this follow-up question should be asked: What's the longest stretch an ultralighter has stayed out without resupply for food? My winter weighted pack of 70 pounds can take me close to 18 days without interruption and this includes 32 oz of white gas, several heavy books, a large Expedition Thermarest and a 4 season tent along with the usual cold weather clothing: Fleece top, down jacket, gloves, rain pants, thermal bottoms and warm hats. But the question remains, how long can an ultrlight backpacker stay out? A cold rain or sleet is hitting the tent and it's a rude thing to face by morning. It sounds like sleet but it's just rain, my first real rain in the round Staika and my hung food bags are getting doused but they are sealed and inverted in a pair of waterproof OR Advanced stuff sacks. Here comes the cold rain and the dogs are out in it and if old Cujo tries to enter my vestibule he will be hurt. Let's hope the Kerlon 1800 silicone fly keeps the water out! Well, I'm back in the Raven's Yard and it is good! Well, ok, morning breaks on the upper South Fork after almost 7 hours of rain which is melting the snow but making for a miserable day of hiking -- cold, muddy, sloppy snow, windy and wet but I am bone dry in my little Staika, the best tent I've ever owned. I'm not sure if this tent ventilates well or not but today there's narry a drop of condensation inside and with my rain jacket covering the foot of my bag, none on the bag. Yippee! I don't know if I'll be pumping nylon today or not but I need to pee, get water in the pot for breakfast and filter water for drinking and check out the hung food bags. This rain will be a test of my vesti door's ability to protect me from the rain, with proper knowledge and use it should work. I need to pee! Indoors, of course, into the cooking pot. The next big challenge will be birthing a young fiesty turtlehead into this cold, cruel world. I'll be sure to get the exact time it hits the ground so as to run an accurate asstrological chart on it. It's Sun is in Pisces but it's Moon was in my Uranus ha ha. Ok, a quick birthing ocurred and I'm back into the cozy dry tent eating a breakfast of carrots, bread, cheese and peanuts. The dogs are wet and cold, it's a miserable day to be out. I wouldn't want to pack up or start out in this kind of overcast cold assed stuff and I don't have to so I won't! Ok, at 11:30 after a good long morning powernap I'm up again and the rain stopped so I'm about ready to gear up the pack and get moving to the highest ground. Packing up a drenched tent won't be fun but it'll just have to be done. ON THE SOUTH FORK/BENTON MACKAYE TRAIL: Ok, I left Iron Camp in a cold fog and started up the 7 sections of the South Fork whereupon I hit more snow and deeper snow, taking me 50% longer to get up the steepest section. Upon hitting Cold Gap I read thru the trail register and saw 2 interesting cards, one dated 1/27/06 of a guy "Thru hiking the B Mac" and another of someone up on the Bob last night and coming down today. I would've seen them had I left the B Mac and climbed the Fodderstack to the tee and the Bob. As soon as I left Cold Gap the snow got much deeper, about 5-6 inches and occasionally it would disappear on the exposed portions of the old Cold Spring Gap trail. At the B Mac connector I ran into the worst of it, 8-10 inches deep on the north slope wrapping around to the ridge at Snow Camp. 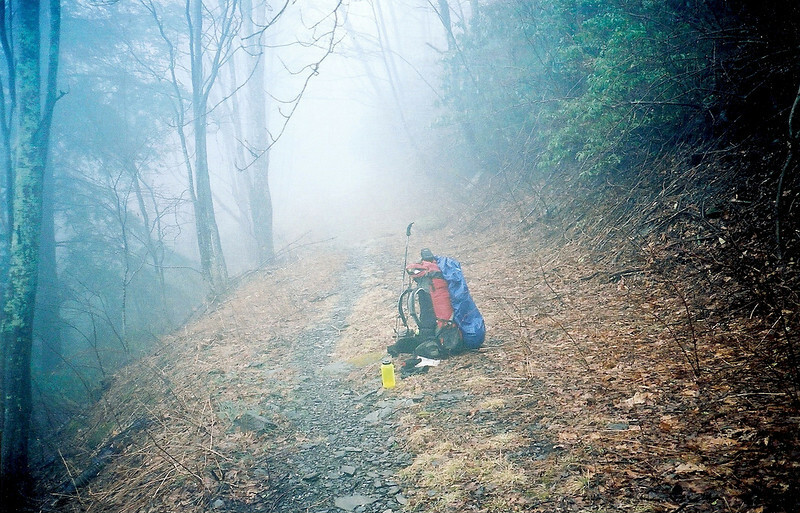 OVERNIGHT AT SNOW CAMP ON THE BENTON MACKAYE TRAIL: I quickly set up the Staika and guyed it out properly, stowed the gear and pack and boots and hung Shunka's food and now I be stylin' as a light rain falls atop Unicoi Ridge. I wish I could be more Buddha like and have good feelings toward the dog that won't leave us alone. I haven't fed it any food in 3 days and yet it still hangs out. It seems confused and scared, somebody certainly dumped it off down at the Fields and unless I run into other backpackers it'll be with us till the end. Most of my gear is dry, what's wet are the gloves, the pack cover, the rain jacket, the filter bag and the food bags from last night's rain. I stopped at Snow Camp spring on the way here and loaded up on 88 ounces of fresh cold water. The snowy trail cleared a bit and Snow Camp is clear of snow so I didn't have to "prepare the site" as usual. My 6 mile hike today took about 4 hours, the clouds come in and at 4 pm it seems to be getting dark already. All I really need to do is hunker down and see this weather thru as it's supposed to warm and clear by Thursday and Friday though they say it'll get cold again by Saturday, sob. This kind of wet cold windy weather is just right for exposure to set in, it's hard to hike in, hard to set up in and hardest to pack up and move in but I'm officially on the high ground of Four Mile Ridge and will stay here until I see the sun. Few people know about this spot and fewer still know about the B Mac connector as I saw many boot prints in Cold Gap going up to the Bob but none along the B Mac to here. Well, they'll see my stumbling gait! 15 hours of rain, it keeps coming down but it's just temporary as it is supposed to stop tonight sometime. It makes cooking a big hassle since the vestibule door has to be opened enough for the stove to prime and I don't wanna! I'll have to go out sometime and unzip Shunka's pack but I think I'll leave my bags in the vesti for the night. The lit incense sure smells good and fills up my little hexagon circle with goodness. Yawn. Though it is above freezing I am cold but I don't wanna lay in my sac quite yet. Winters in the southern appalachians can be a dark and lonely affair. Here is another Staika con: The elastic pole clips on each door side which pull the open door back and attach to the inside fly seam leaks! It's the common problem of absorbtion like a sponge and drips. When I get back I'll have to seam seal the tent and especially around the clips. McNetts silnylon sealer, never used but I will this time. Ok, I've done everything I can do to sit out this 19 hour rain, I've eaten milk and cereal, I've burned sage and prayed, I cleaned the pot and peed, I've listened to the radio and now I listen to the wind blow over as I prepare to zip up and lay this tired body down and wait for a new day's fresh light and the end to this precip. I need to go outside and fix Shunka's pack and retrieve my backpack cover and I probably will as the rain has finally stopped enough to do so.